The Discovery Zone, Luxembourg City Film Festival came to a close this weekend with a presentation of the 5th biannual Lëtzebuerger Filmpräis – or Luxembourg Film Awards – at the Casino 2000 in Mondorf-les-Bains (though the Lëtzebuerger Filmpräis were last staged in 2009). The event was hosted by Gabriel Boisanté and attended by 800 representatives of the local industry. 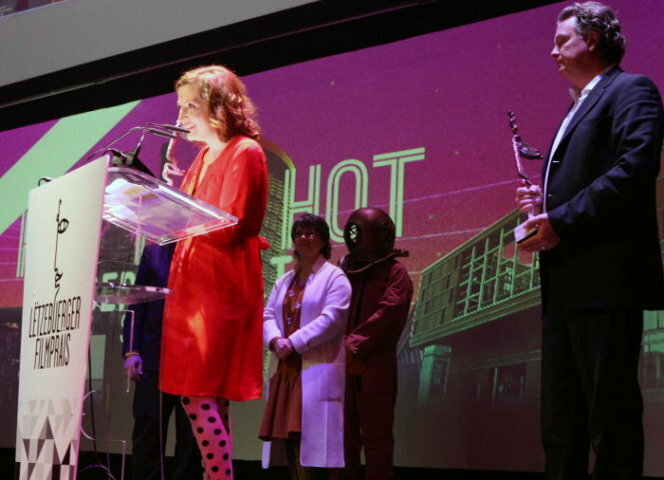 Taking the top prize of Best Luxembourg Film was writer/director Beryl Koltz' Hot Hot Hot in her fiction feature debut. Set at a sauna, Hot Hot Hot is an English-language comedy that stars Rob Stanley and Joanna Scanlan (trailer below). Having been made with Belgium and France, Olivier Masset-Depasse's drama Illégal won Best Co-Production. It tells the story of a young Russian woman Tania who lives illegally in Belgium with her young son and her subsequent arrest. The winner for Best Documentary was High Low by Jean-Louis Schuller and Sam Blair. Schuller also won Best Technical Contribution for his work as a cinematographer. The Best Animated Film was Claude Gosch and Luc Otter's Rose & Violet. 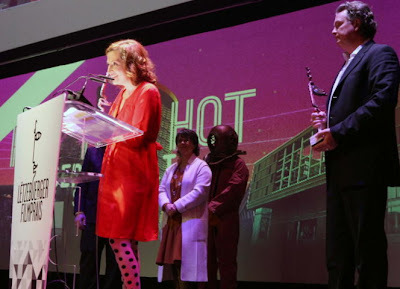 Hot Hot Hot, High Low and Rose & Violet were all produced by Samsa Films. The Best Short film was Govinda Van Maele's En Dag am Fräien (A Day Off). For Best Artistic Contribution, there was a tie between André Dziezuk for his music over the last several years, and Paul Scheuer and Maisy Hausemer for their screenplay for D'Symmetrie vum Päiperlek (The Symmetry of the Butterfly). The Prix du jeune espoir for new talent went to Vicky Krieps for her role on Measuring the World by Detlev Buck. She has appeared in Hanna and Anonymous. For this 5th edition, 13 short films, 12 co-productions, 4 Luxembourg films, 12 documentaries and 5 animated works were in contention for awards. The jury for the 5th Lëtzebuerger Filmpräis consisted of Vesna Andonovic, Claude Bertemes, Roger Fohl, Claude Frisoni, Max Permantier, Jean-Pierre Thilges and Jury President Marie Labory.